First day! Whoo Hoo! Today set the pattern of the days to come. First was camp coffee. 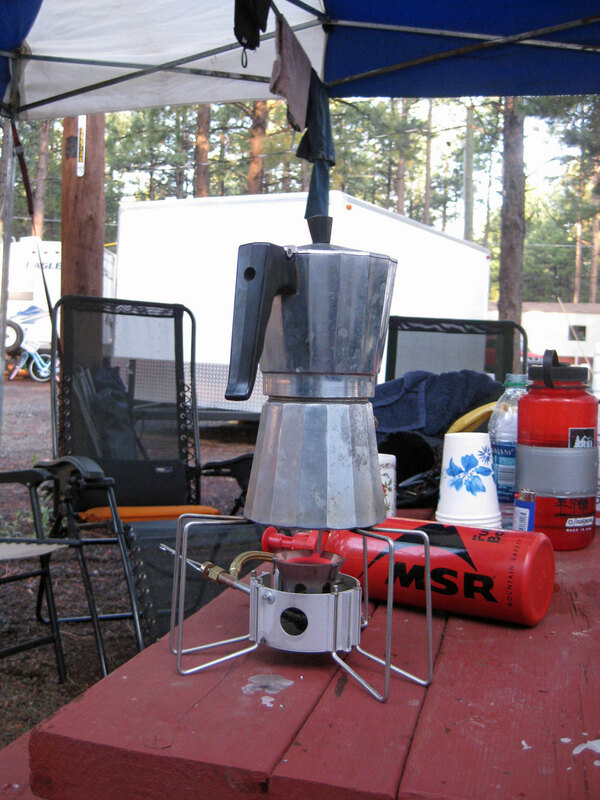 Between the seven of us, we had three coffee makers and we put them all to good use. 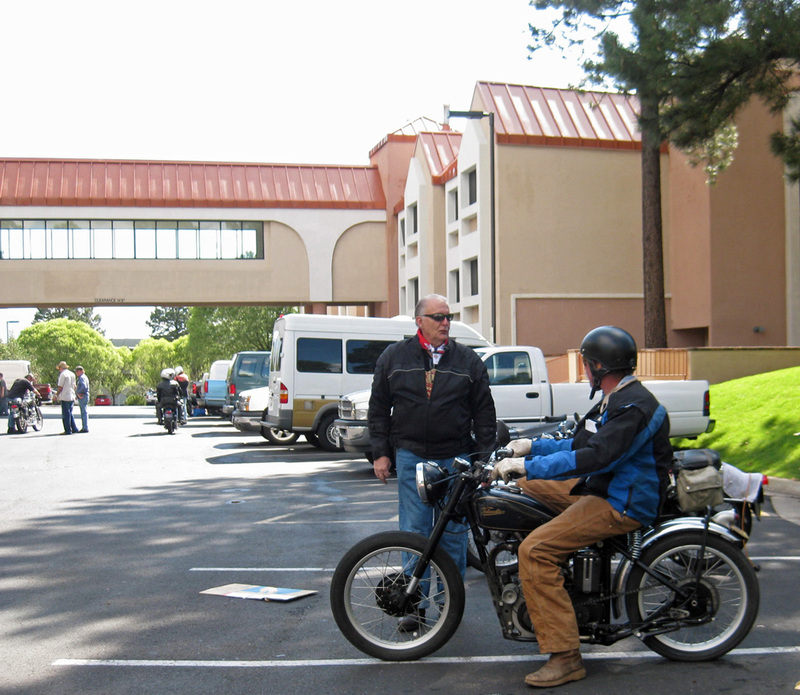 This morning, in addition to coffee, we ate banana nut bread, yogurt and blueberries, before joining the rest of the gang at the nearby Radisson hotel. Pete ties Atticus on to Kim. 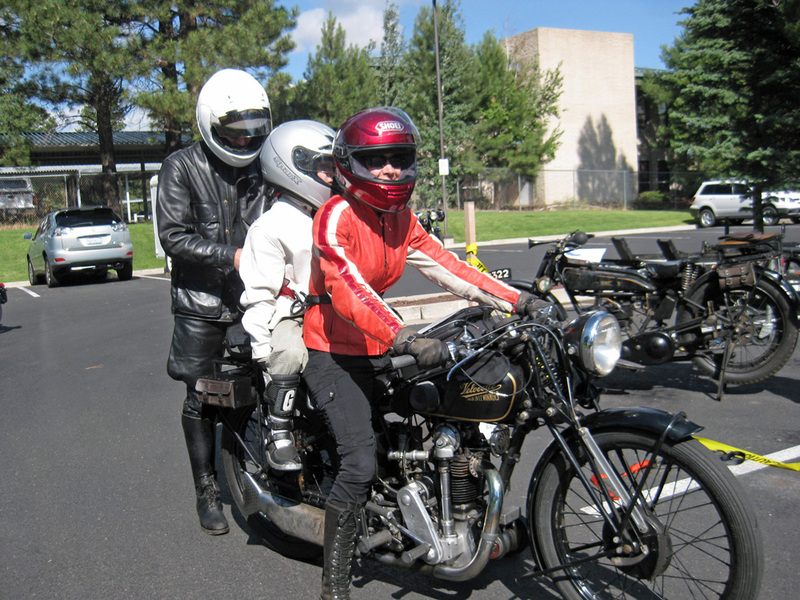 Both Atticus and Sirisvati rode on the back this year. The route seemed straight forward. 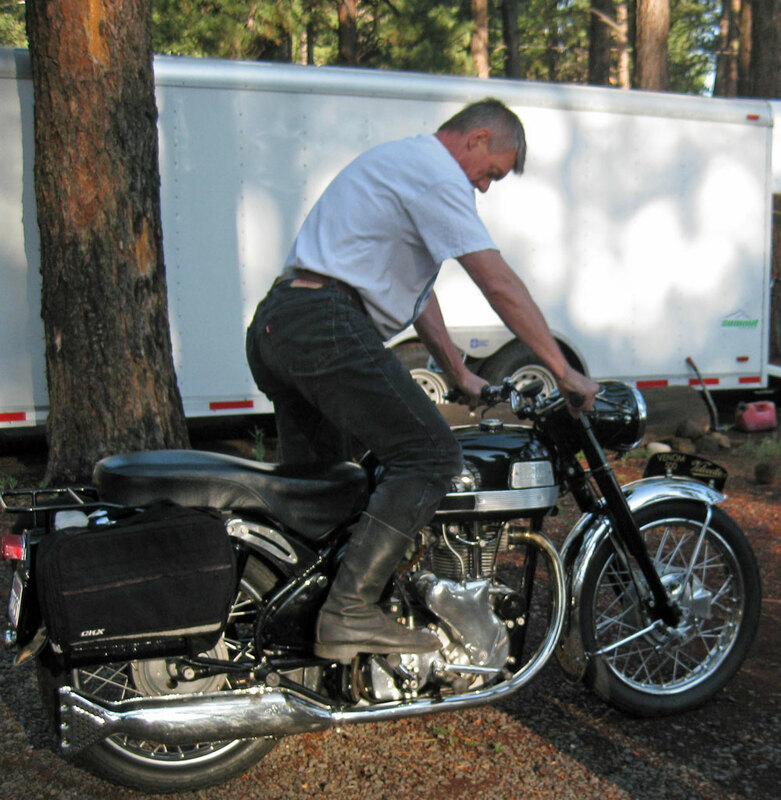 We headed north and east out of Flagstaff and rode through the Coconino National Forest. After that, the desert stretched as far as the eye could see in every direction. We were on reservation land. This was a great shake-down ride, especially for those not used to riding long distances. 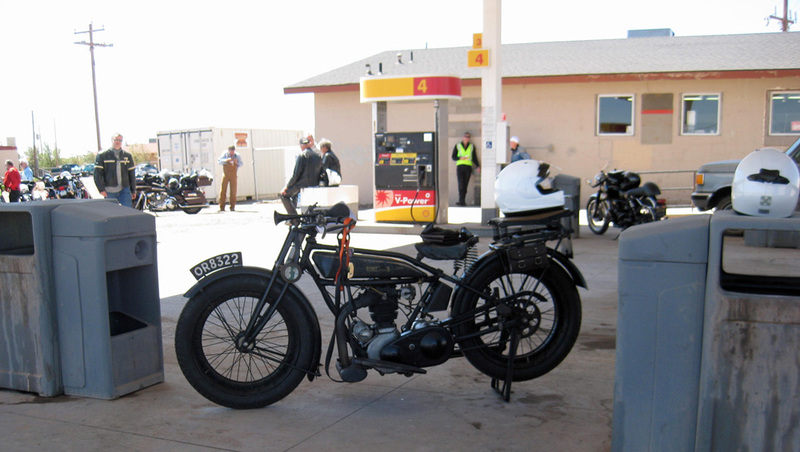 Our first stop, at a Shell gas station in Leupp, was needed by many. From here our route turned south down Highway 99. The only problem was that the sign with those essential numbers was hidden by a plethora of other Important Info. Some of us, including my group, rode off into the desert. I was worried about fuel. The desert looked endless. Treeless. Although we had great weather, the desert is not a place where I wanted to run out of fuel. 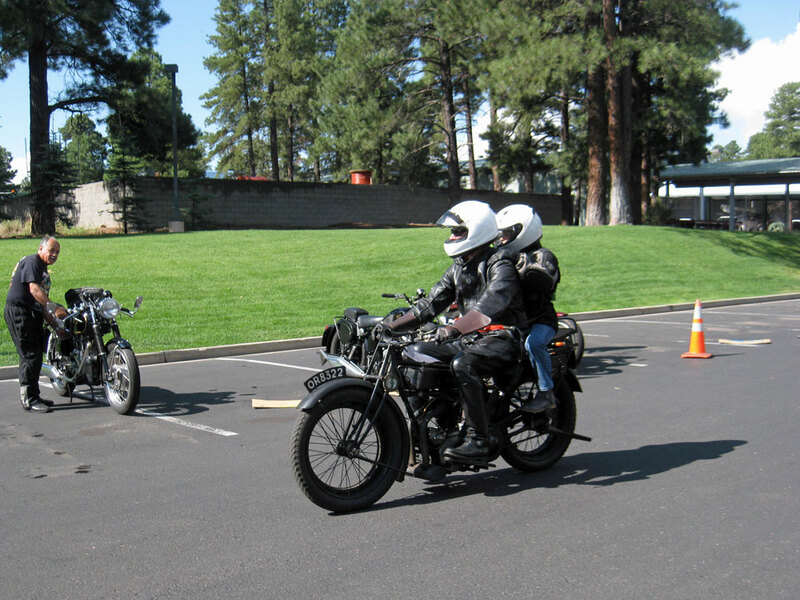 The result was I was quick to catch the turn-around signal from another rally participant, who had turned around and was riding in the opposite direction. 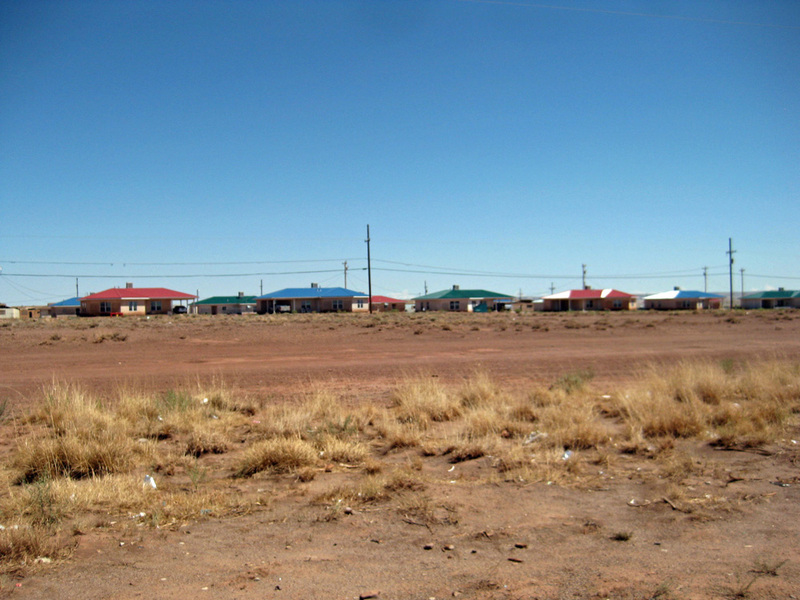 We went back to Leupp and this time, I filled the tank. Here I met a charming local. When I asked her for directions, she looked at me and then looked at my bike and said, “Take the paved road.” Very wise words. On our second try, we found Highway 99 which took us to Interstate 40. 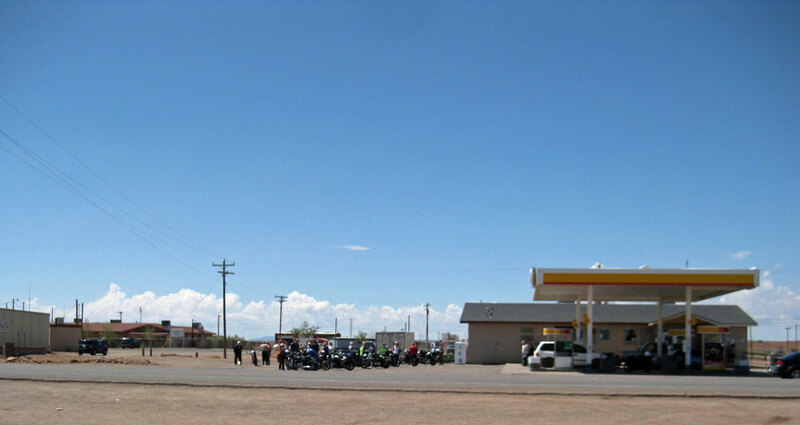 The real fans of coffee went further east into Winslow for another latte. The rest of us joined the roaring traffic (speed limit 75 mph). 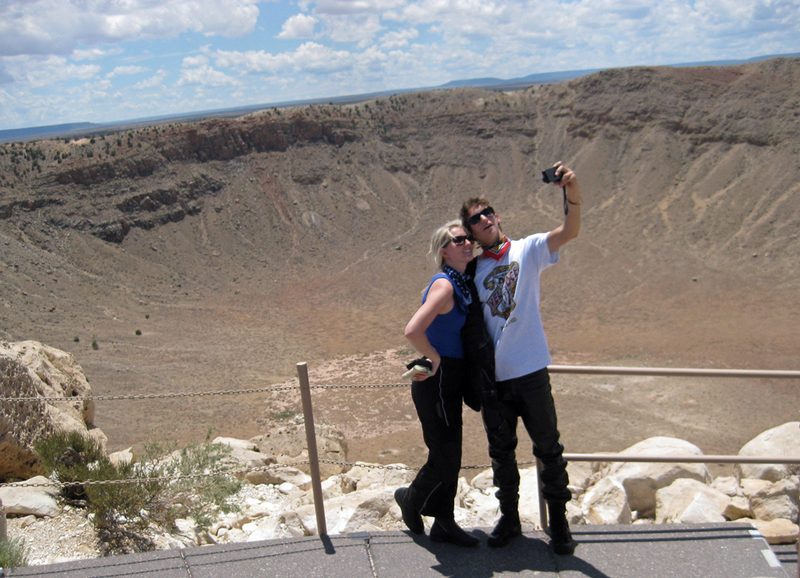 The big stop of the day was at the Meteor Crater. What an amazing place! 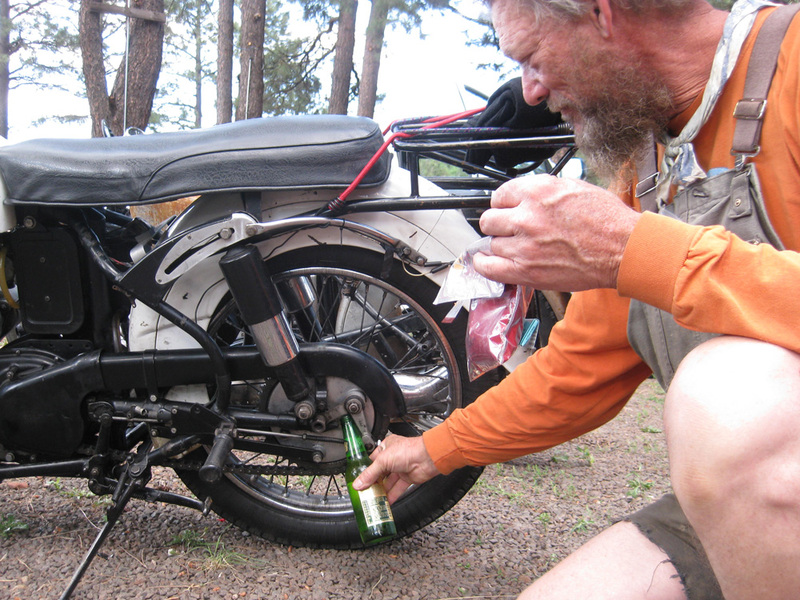 At the end of the day, people traded stories, worked on their bikes and relaxed. 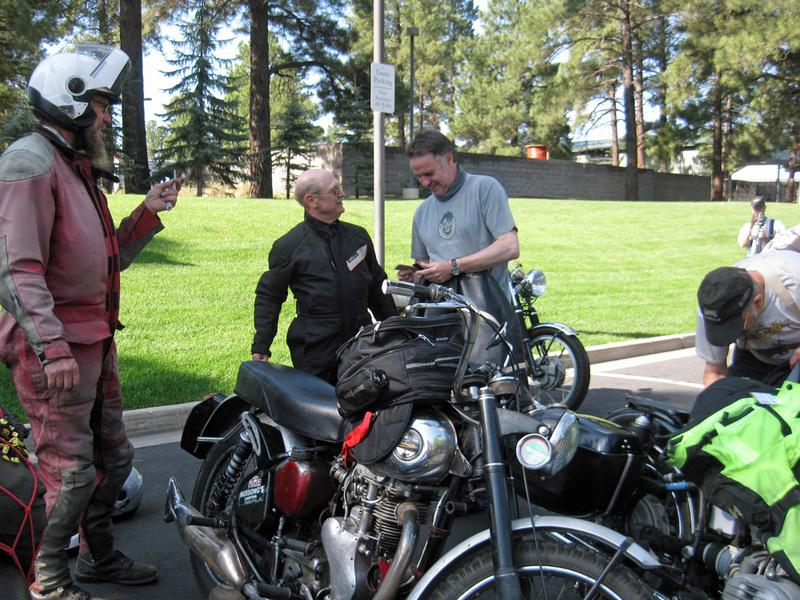 Our president, Jim Abbott was seen on the side of the road with three of the local police. Turns out he had run out of fuel right on the edge of town. 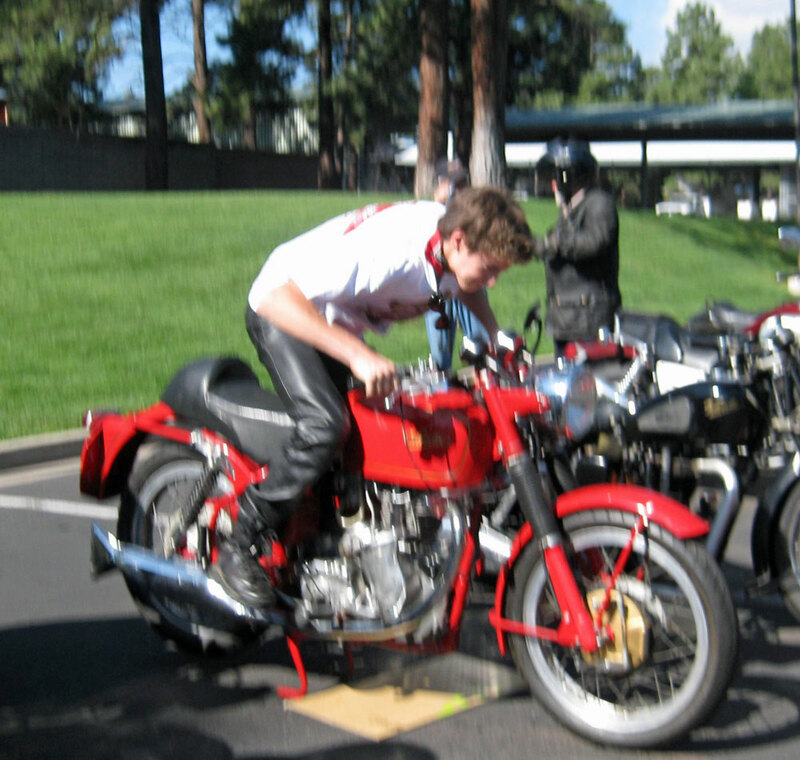 Since he was close to a gas station, he decided to push the bike in for fuel. However, some good samaritan reported a motorcycle accident. Besides the three police, one ambulance and a fire truck turned up before Jim could call off the forces. A president’s job isn’t easy. 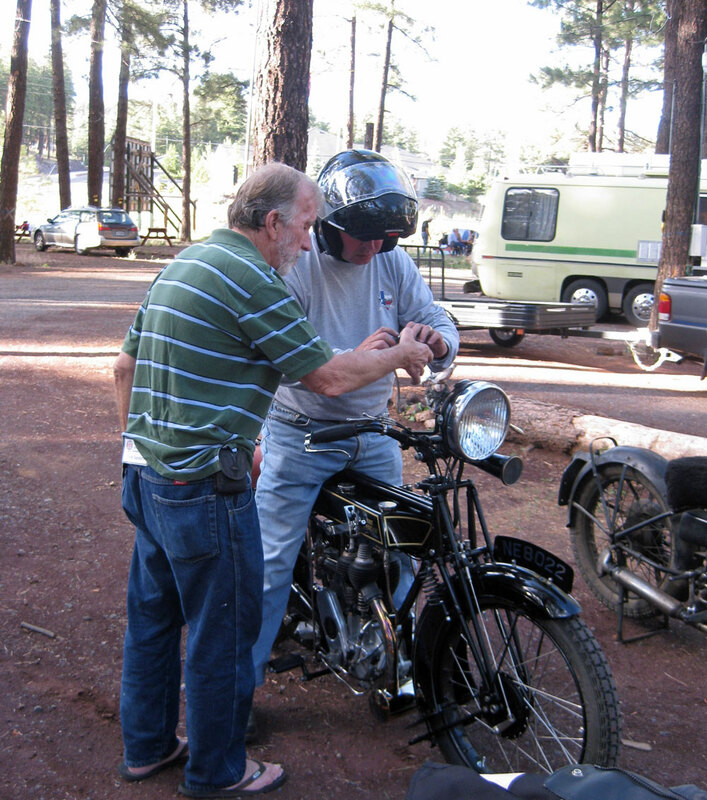 How many Velocette mechanics does it take to set a modern watch? 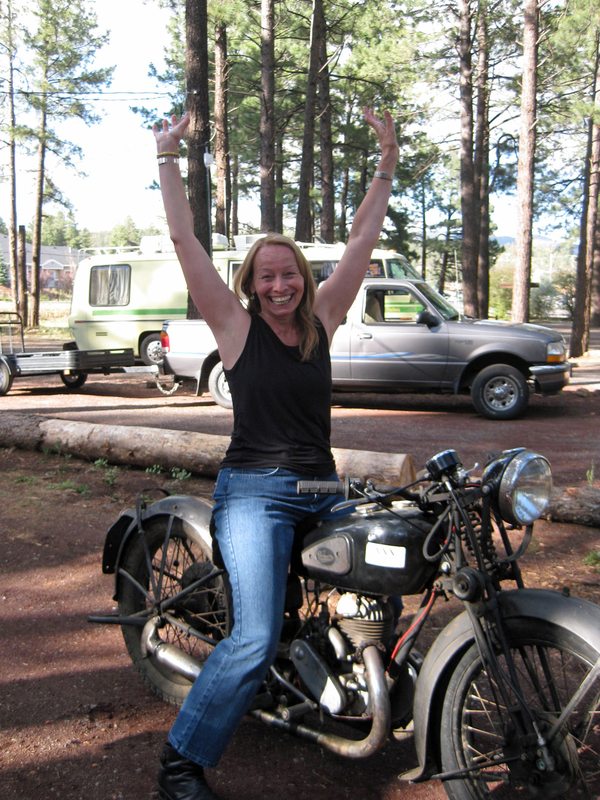 In camp, Gwen rode the 1946 GTP, her first time riding a motorcycle! 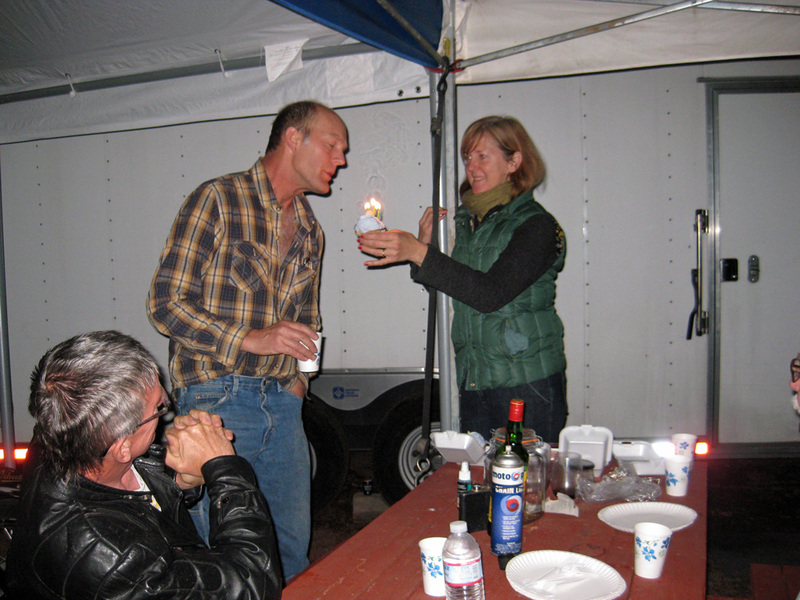 And we celebrated Jeff W.’s birthday. 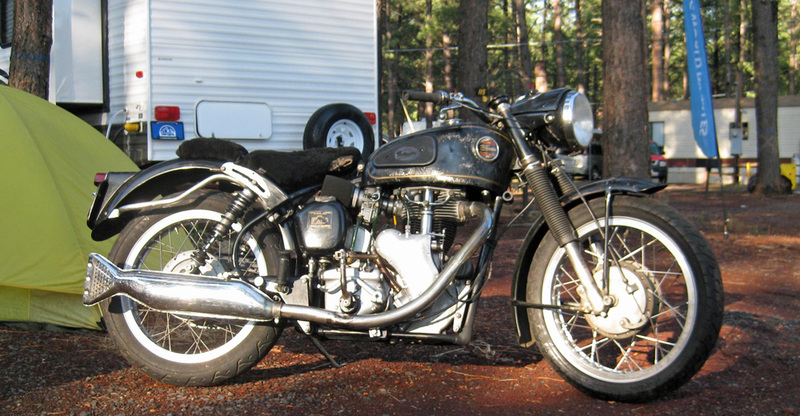 This entry was posted in Velocette & other British Motorcycles and tagged motorcycles, Velocette, vintage motorcycles, VOCNA. Bookmark the permalink.